Experience in a special way different aspects of the history of the Berlin Charité during the era of National Socialism. 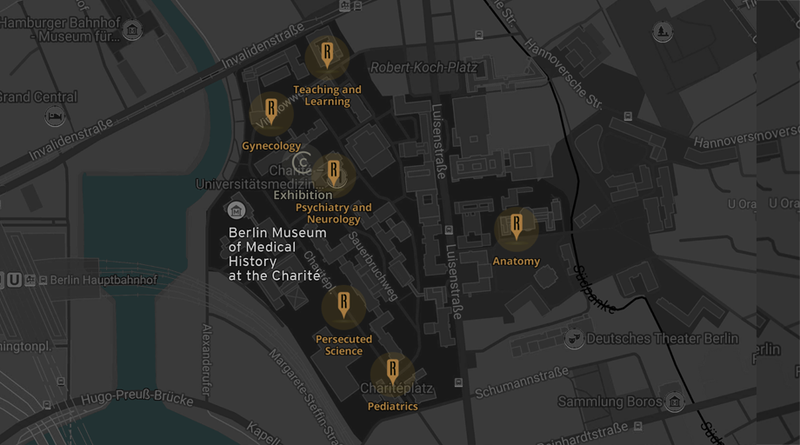 The REMEMBER app accompanies you on your journey through the Campus Charité Mitte in Berlin. The app leads you to six memorial sculptures and opens up artistic perspectives on this dark episode of history. 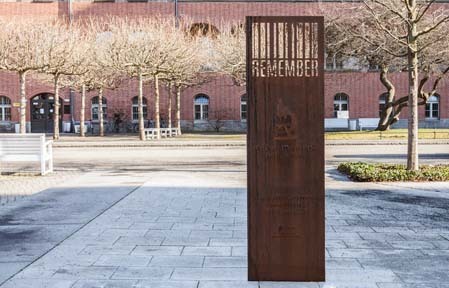 REMEMBER is the art project of the artists Sharon Paz, Jürgen Salzmann, and Karl-Heinz Stenz and was selected as the winner of the competition “Memory Path”, GeDenkOrt.Charité – Science and Social Responsibility. As an interactive memorial, REMEMBER brings traces of this past into the present. 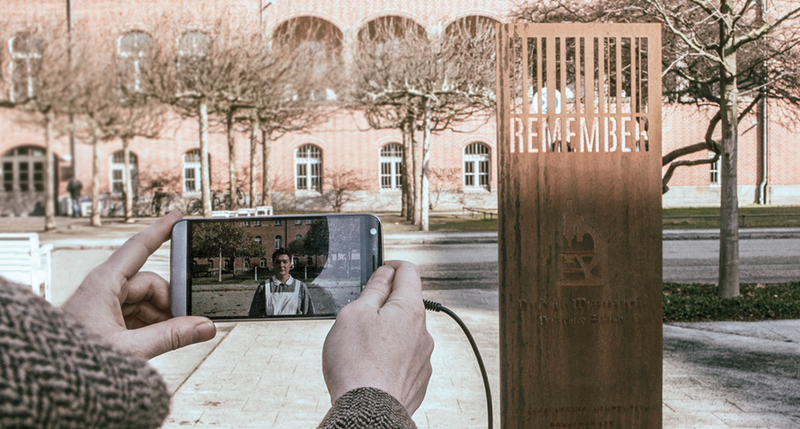 It connects current technologies with contemporary art and thus allows previously silent sites of remembrance to speak. The central starting points are the memorial sculptures located at six historical sites on campus. The memory path includes a free app for smartphones and tablets that features interactive video art at each of the sculptures. Two fictional characters, a nurse and a caretaker, accompany visitors through the memory path and invite them to experience brief travels in time. Through the combination of different elements, the memorial sculptures, video art, and the original environment, REMEMBER creates a living remembrance. The Charité is one of the most modern university clinics in Europe: here education, treatment, and research are closely intertwined. The Charité was founded in 1727 as a Berlin civil hospital, and its name was understood as a mandate: Charité meaning mercy and compassion. But there were also times when medical knowledge was employed for political purposes. During the reign of the National Socialists, doctors at the Charité were among those who supported the goals of the National Socialism regime and even committed crimes against people of all ages by participating actively inhuman practices focused on race, performance, and extermination. 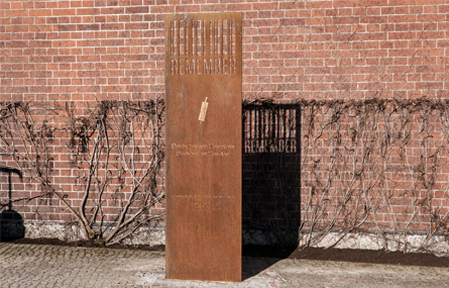 Against the background of these National Socialism crimes, the explicit goal of the memorial work at the Charité is to take responsibility for the consequences of this time and to enable an ongoing dialogue about responsibility in medicine and science that is not limited to the past but that also encompasses the present and the future. A special font was chosen for the name of the stations: the “Schwabacher,” which was defamed and forbidden as “Schwabacher Jewish letters” in the Normal Script Ordinance of 1941. The font has its origins in the Nuremberg region of the 15th century and was disseminated in Germany primarily through the Lutheran Bible and its reprints. It was later so commonly used for emphasis in Fraktur texts that to add any textual accentuation was referred to as “schwabaching.” Why the font was suddenly referred to as “Jewish letters” remains a secret of the Nazis. At the center of each sculpture is the engraving of a representative object: glasses, a syringe, a head-measuring instrument, a microscope, forceps, and a bone saw. The originals are located in the nearby Berlin Medical History Museum of the Charité. Medical findings are sometimes rooted in the practice of conducting research on corpses. Students gain essential topographical and morphological knowledge through dissecting a body. In the encounter with the dead they gain a first experience of the balance between professional distance and empathy. In the era of National Socialism the anatomical institutes acquired corpses of victims of NS-specific injustice and used these for research and teaching. Because the autopsies took place without the consent of those concerned, thereby violating their final repose and human dignity, they must be regarded as ethically problematic from a contemporary perspective. At the Berlin Anatomical Institute, the director, Hermann Stieve (1886-1952), conducted research on the bodies of executed women from the Plötzensee Prison. GeDenkOrt.Charité is an interdisciplinary working group of the Institute for the History of Medicine, the Berlin University of Art, and the Berlin Medical Historical Museum. Die Charité – Universitätsmedizin Berlin aims to be an example of human science that takes responsibility. 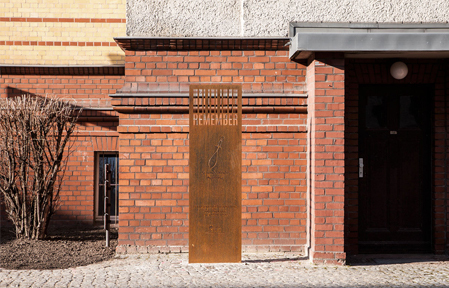 Through GeDenkOrt.Charité, a site of reflection and information has been created on the historic campus of the Charité in Berlin-Mitte. History: at the authentic site, to convey information about events and contexts that attest to the massive failure of medicine (during the NS regime) with respect to “science taking responsibility”. Present: to remind a national and international public of the the importance of “science taking responsibility”. Future: to foster a creative and innovative confrontation between students and young doctors concerning the potential danger zones of “science taking responsibility”. The REMEMBER memorial path is an artistic contribution to this project. Further information about the project and events can be found on the website. Sharon Paz, Jürgen Salzmann and Karl-Heinz Stenz have collaborated in different national and international projects since 2005. These projects range from Video Art to Live Art and Site Specific performances. For REMEMBER they also invited their longtime colleague Danielle Ana Füglistaller into the artist group.They all share a strong interest in political and social topics. SHARON PAZ (* 1969 in Ramat Gan/IL) lives in Berlin. She graduated with an MFA from Hunter College, New York. She has exhibited her works at the Kunstmuseum Weserburg, Bremen, at Smack Mellon in New York City, the Herzlyia Museum of Art and the Petach-Tikva Museum of Art in Israel. Her performances were shown in DOCK11, Sophiensaele, Berlin, FFT Düsseldorf, Studiobühneköln and Akko Festival, Israel. Her projects have been supported by the Senate Department of Culture, Berlin, Capital Cultural Fund, Berlin, The Israeli Fund for Video Art and Experimental Cinema, CCA Tel-Aviv and Goethe-Institut in Tel Aviv. Her video works are featured in the collections of the Neuer Berliner Kunstverein (Video Forum) and the Israel Museum in Jerusalem, and have been screened in numerous festivals and galleries such as the Thomas Erben Gallery,the Art in General in NYC and Transmediale 11 in Berlin. Sibylle Kufus, Head of Education, Management C/O Berlin Friends e.V. who were victims of the Charité involvement in the National Socialist injustice system. This website was created under the responsibility of the project group "GeDenkOrt.Charité – Wissenschaft in Verantwortung" of the Charité – Universitätsmedizin Berlin. Borrow a tablet from Charité with the app already installed on it. For Information on the tablet loan contact the Berlin Museum of Medical History at Charité. In the download option, all the app’s video and audio material will be downloaded onto your device. The download time depends on your connection speed. Please leave REMEMBER app open and active whilst downloading! Your device must be connected to the internet while walking the ‘Memory Path’ on the Charité grounds. It is best to connect it to a Wi-Fi Hot Spot whenever possible. A good internet connection is not always possible on the Charité grounds. It is therefore recommended to choose the download option instead. Under ‘Settings’, you will be able to add subtitles and change the resolution and language settings any time. The introduction video will show you how to experience the ‘Memory Path’ and explain how to interact with each station. Although the video begins automatically, you can start them manually in the menu. 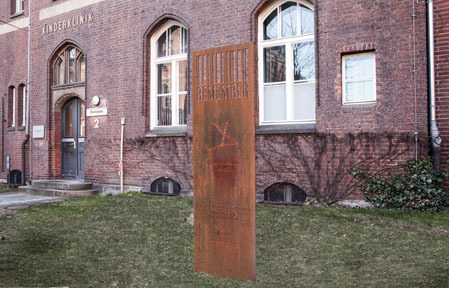 You can begin REMEMBER’s ‘Memory Path’ anywhere on the grounds of Campus Charité Mitte. The order in which you experience the stations is up to you. The app’s interactive map leads you to each station and gives you your current location. Using multi-touch gestures, you’re able to move the map and zoom in and out of it. For the app to be fully functional, however, you must give it permission to access your device’s camera and location. You will find a ‘REMEMBER Sculpture’ at each of the six stations. As you approach one of the stations, tap the pin on the map, a SCAN button will appear on your screen. Push it and the app’s scan mode will be activated. 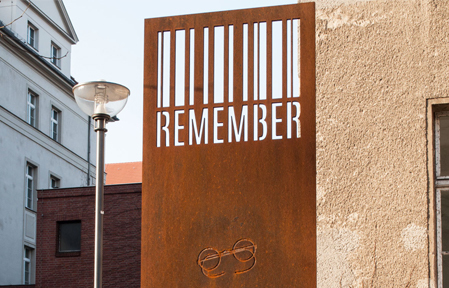 To retrieve the station’s media content, position your device in front of the ‘REMEMBER Sculpture’ so that a live image of the sculpture’s barcode appears on your screen. Upon doing so, you will immediately start interacting with the station. NOTE: This requires you giving the app permission to access your device’s location and camera. This station’s media content features augmented reality (AR) images. After being shown an introductory video, the app’s AR-browser will appear on your screen. Point your device’s camera at the building as seen in the picture below. The station’s AR content will only be fed to your device if you are holding your device vertically. By touching one of the silhouettes appearing on the screen, you will be given biographical information on that person. Tap the screen to continue the tour. A ‘video-walk’ has been designed for you to interact with this station. The video walkthrough can only be experienced at one location (Bonhoefferweg 3). In the video, the surroundings will match the surroundings of this specific location, giving you the impression of a live image. To experience the video walkthrough correctly, you will need to start the video directly in front of the ‘Neurology and Psychiatry Sculpture’. The video also begins at this location and leads you in and through the building while it’s being played. Follow the path filmed in the video. In other words, walk as if you were standing behind the camera and filming what you see in the video. While walking, focus on the architecture around you, not on the people in the video. Wearing headphones is highly recommended. What to do if you go the wrong way or do not know where to go during the video walkthrough? Rewind the video using the scroll bar until you reach a point at which you were still ‘synchronized’ with the video walkthrough. Go back to this location and face the image shown on the screen. Press the PLAY/PAUSE button and continue the walkthrough video. After the introductory video, a 360° video will appear on your screen. Turn your body with your device to immerse yourself with the video’s content. In the video, you will see a caretaker. Follow his path into the courtyard. If the door to the courtyard is locked, just continue watching the video from outside. After the video, a virtual “Volksempfänger” (=people’s receiver; the common radio receiver during the era of National Socialism in Germany) will appear on your screen. To change stations, touch the buttons shown on the virtual radio interface. An image of the Anatomy Building will appear on your screen. 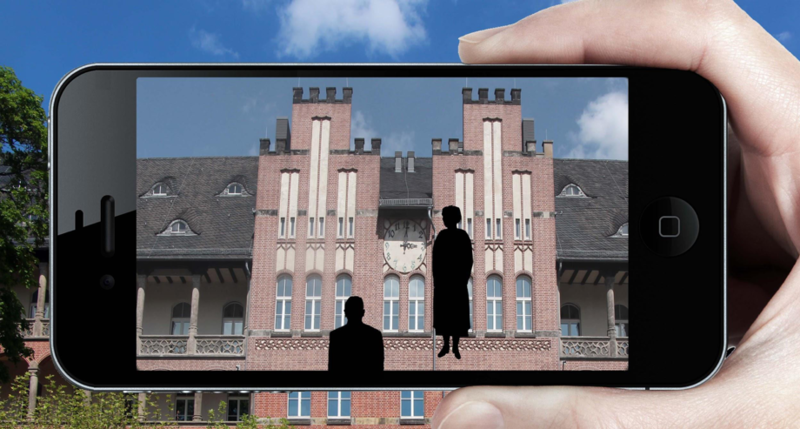 Swipe over the whole screen to open its façade and take a historical trip back in time. Technical information isn’t needed at this station. Just enjoy the video! Experience in a special way different aspects of the history of the Berlin Charité during the era of National Socialism. 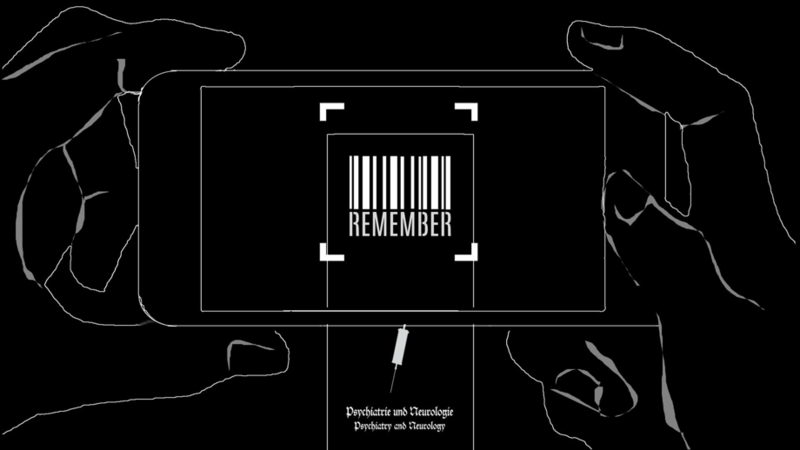 The REMEMBER app accompanies you on your journey through the Campus Charité Mitte. The app leads you to six memorial sculptures and opens up artistic perspectives on this dark episode of history. As an interactive memorial, REMEMBER brings traces of this past into the present. It connects current technologies with contemporary art and thus allows previously silent sites of remembrance to speak. The memory path includes a free app for smartphones and tablets that features interactive video art, 360 degree videos, and augmented reality. Two fictional characters, a nurse and a caretaker, accompany visitors around the memory path and invite them to experience brief travels in time. Through the combination of different elements – the memorial sculptures, video art, and the original environment – REMEMBER creates a living remembrance. "We want to emphasize respect for every human life and to initiate reflection on our own behavior." 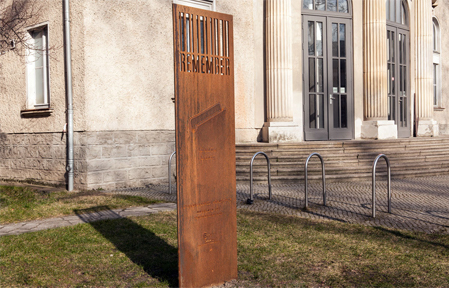 REMEMBER is the public art project of Sharon Paz, Jürgen Salzmann and Karl-Heinz Stenz that was selected in an open call for the “Memory Path”. GeDenkOrt.Charité is an interdisciplinary project and is a collaboration of the Institute for the History of Medicine and Ethics in Medicine, the University of the Arts Berlin and the Berlin Medical Historical Museum among others. 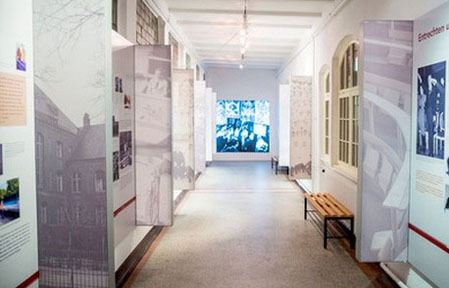 The REMEMBER memory path and the historical exhibition at Bonhoefferweg 3, form the GeDenkOrt Charité – Science and Social Responsibility. This project was made possible with the kind support of: Stiftung Deutsche Klassenlotterie Berlin, Friede Springer Stiftung, Freundeskreis der Charité e. V.